Bring a bit of the great northern woods to your garden with this Heartwood Sleepy Hollow Bird House. This Loose Moose version has a metal moose shape, complete with large antlers, topping the home, and metal pine tree accents resting near the entrance hole for added interest. The distressed verdigris finish on the exterior of the copper roof contrasts the white house, while the antiqued copper color on the underside of the roof brings more interest to the piece. A 1.5" diameter entrance hole sits in the center of the front of the home, allowing small songbirds to roost in this generous abode. A shiny copper panel on the back removes easily for nest checks and observation. A hole in the center of the base helps keep nests dry, and long slots under the overhang of the roof aid in regulating the interior temperature. The thick, cellular PVC construction insulates the home and adds durability for use over time. Mount this house to a post or pole for height and drama. 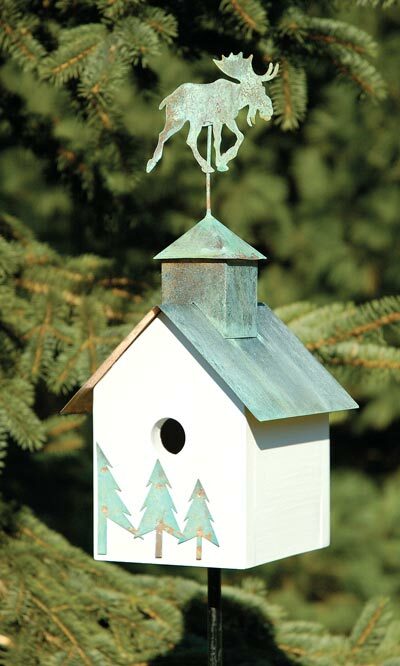 Add a rustic look to your yard with this Loose Moose version of the Sleepy Hollow Bird House. Made in the USA. Note: As the pine tree accents are hand applied, individual placement may vary.